The 2014 Festival of 1000 bikes has been cancelled due to recent uncertainty over Mallory Park’s sustainability. The press release reads as follows. Imagine that 3 is a 4. That’s how their logo would have looked. 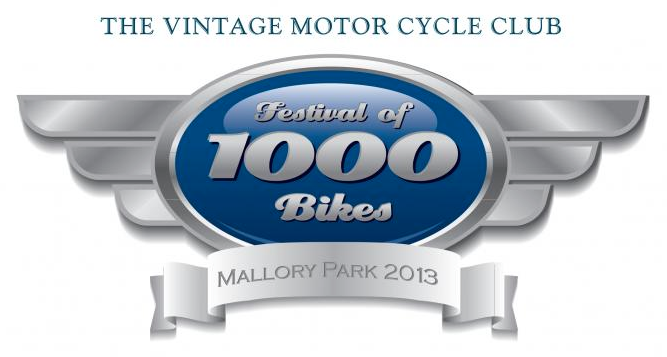 It is with great reluctance that the Management of the Vintage Motor Cycle Club Limited announce that the Festival of 1000 Bikes™ will not be taking place in 2014. Motorsport fans will be aware of the uncertainty that surrounded the future of Mallory Park in the latter parts of 2013, which placed the circuit operators (Mallory Park Motorsport Ltd) into administration in the autumn. The new operators, Real Motor Sport Ltd, were recently announced and we have full confidence in them, indeed our racing arm (BHR) already have a date in their calendar at Mallory Park this year. However because crucial months of planning and preparation have been lost we are not equally confident of delivering this prestigious event with the amount of time remaining. We sincerely apologise to all those members of the Club and to the many other enthusiasts who look forward every year to this event. The Festival of 1000 Bikes, being widely acknowledged as one of the premier events in the motorcycling calendar, we did not feel we could proceed without full confidence of being able to offer an event of the high quality which is now expected from this wonderful weekend. We would like to take this opportunity to thank our sponsors including Michelin, Footman James, Bonhams and Eriks for all their support in the past. Also to all the VMCC members and enthusiasts who have embraced the Festival and made it the unique event it has become. We hope to see many of you at our other events and shows throughout the year and look forward to making an early announcement regarding the Festival for 2015. So, all is not lost and we could see the Festival of 1000 bikes back in 2015. The lack of preparation time needed for an event as large as this one is what was missing. Here’s hoping we see it back at Mallory next year.